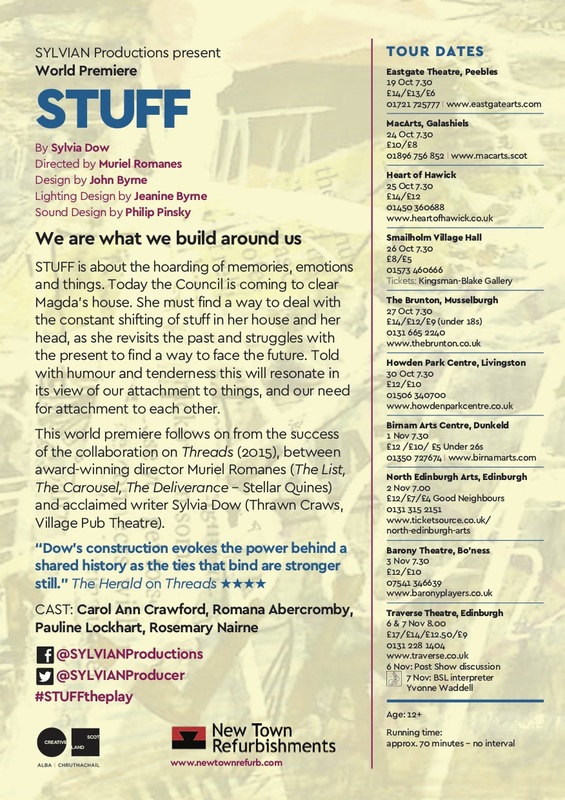 We are honoured and delighted to be chosen as a venue on the professional touring production of local Bo’ness playwright Sylvia Dow. This world premiere follows on from the success of the collaboration on Threads (2015), between award-winning director Muriel Romanes (The List, The Carousel, The Deliverance – Stellar Quines) and acclaimed writer Sylvia Dow (Thrawn Craws, Village Pub Theatre). 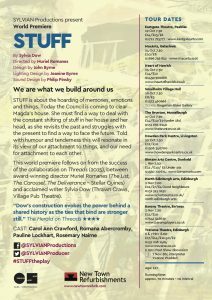 Please come and join us for what is sure to be a fine piece of home-grown Scottish theatre. 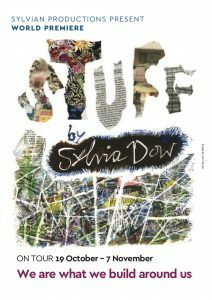 STUFF is about the hoarding of memories, emotions and things. Today the Council is coming to clear Magda’s house. She must find a way to deal with the constant shifting of stuff in her house and her head, as she revisits the past and struggles with the present to find a way to face the future. Told with humour and tenderness this will resonate in its view of our attachment to things, and our need for attachment to each other.